What’s The "Advance Tabco" Difference? 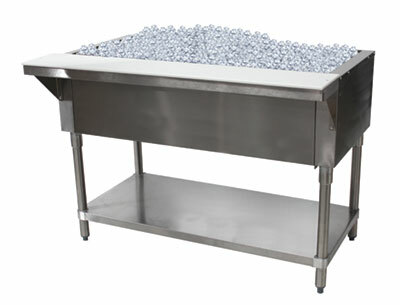 Many hot and cold food tables on the market come with a square, corner style leg assembly. This is time consuming to set up, and forces the undershelf in a fixed position. Advance Tabco provides hot and cold food tables with tubular legs that mount into a gusset. The undershelf can be positioned where needed, and adjusted. Additional undershelves can also be added. Some hot food tables include control knobs that are flush to the body of the unit. When food is being moved to and from the food pan to the cutting board, grease and liquid will inevitably drop through the crack between the cutting board and the metal. This will eventually get to the control knob, and cause it to clog. Advance Tabco has a recessed control knob, which helps prevent clogs, and saves on warranty calls. 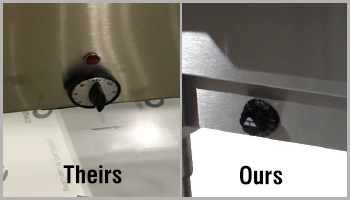 The recess also helps to prevent the knob from being bumped and the temperature inadvertently changed. Advance Tabco provides a stainless steel cutting board support shelf that runs the full length of the cutting board. Some others on the market cut their support shelf to save on material. 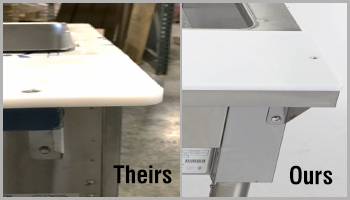 If a person were to lean on the end of the cutting board without the full support shelf, the cutting board may be inclined to flip, creating a safety issue. 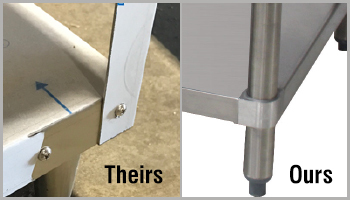 Advance Tabco’s undershelf is secured to the leg using our aluminum die clamped corner collar. 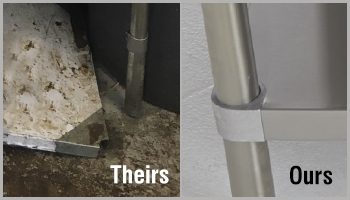 Some companies use a welded collar, which is far more likely to snap (at the weld) if something heavy is dropped on the shelf, or if someone tried to stand on the shelf to reach something on a high shelf. Advance Tabco’s undershelf provides slightly more storage space as well.